The recent publication Performing New Lives: Prison Theatre (Jessica Kingsley Publishers, 2011) draws together some of the most original and innovative programmes in contemporary prison theatre. Jonathan Shailor of Jessica Kingsley Publishers interviews Brent Buell, one of the contributing authors of this book. Brent is a well-established New York City actor, writer, director, producer, filmmaker and social activist. He is the author of chapter three, entitled Rehabilitation Through the Arts at Sing Sing: Drama in the Big House. Jonathan: Let’s start at the beginning. How did you become involved in prison theatre? What has this experience meant to you? Brent: A friend of mine was teaching GED (General Education Diploma) courses at Riker’s Island, a huge New York City prison, and his enthusiasm was infectious. I was hoping to find a way to use my acting and theatre background in a prison setting. Then by chance, I met Dr Lorraine Moller and she told me about a prison theatre programme at Sing Sing Correctional Facility called Rehabilitation Through the Arts (RTA). I met with the programme director, Katherine Vockins, did my volunteer orientation, and the rest as they say is history. I love theatre. I think that it is one of the most powerful forces for social change that exists. For ten years I’ve witnessed how magnificently theatre – just theatre, no therapy, no sociodrama, no psychological agendas – can touch and renew the human spirit. Jonathan: Tell us about your chapter in Performing New Lives. What is it about, and why did you choose this focus? Brent: RTA is the theatre programme that functions at Sing Sing and a number of other facilities. Thanks to Warner Brothers movies, Sing Sing became known as “The Big House”. It has housed some of America’s most “famous” prisoners. It is the location of the infamous Death House where Julius and Ethel Rosenberg and 612 other people were executed in the electric chair that was grimly nicknamed “Old Sparky.” So, to point to drama in that big house – drama of a wonderful, positive and life-changing kind – seemed the right choice of title. My focus was personal. It was about my experience as a volunteer and how while watching theatre change others, I myself was changed. Jonathan: Who do you hope will read the book and your chapter? What do you hope they will take away from it? Discovery. That’s what this book is about. The reader will discover himself or herself in a world that they have largely imagined through the lens of movies and TV as a zoo, where daily life consists of murder plots. They will discover a world of people learning, growing and changing through the education that begins with theatre. Once a person finds that theatrical literature is a gateway to places and ideas that were never a part of growing-up life (most prisoners have never seen a live stage play), the desire to learn more is the inevitable follow-up. I watched men who had spurned education decide to enroll in a GED programme, then matriculate to college, and then go on to get their masters degrees. Wow. That’s what’s in the pages of Performing New Lives. 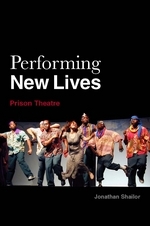 You can buy Performing New Lives: Prison Theatre (Jessica Kingsley Publishers, 2011) online. Original generation time 1.7852 seconds. Cache Loaded in: 0.0004 seconds.